The school takes the form of a pavilion opening on to a part-sheltered play area with a park beyond. The selection of materials is a key part of the scheme’s success. The black stained Siberian larch sits inconspicuously in the trees and contrasts with the white-washed internal woodwork. All the details are well controlled, from exposed conduits to the selection of nursery furniture and material finishes. This newly completed Oasis Academy Hadley, Enfield – a specialist Maths, ICT and Music school – has been designed as a highly sustainable building. 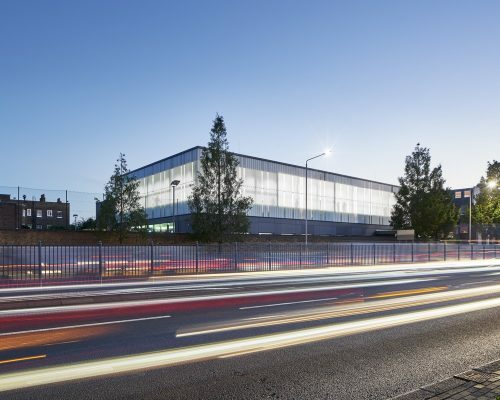 Located on a former industrial site, the project sits at the heart of a wider urban regeneration plan. This ambitious scheme delivers a vibrant new learning campus for the Academy’s primary, secondary and sixth-form students and will also play a pivotal role as a new community hub, with a range of cultural and sports activities (indoor sports hall, dance studios, changing rooms, and an all-weather pitch and multi-use games area) available outside school hours. Proposals for the Mossbourne Victoria Park Academy have been granted planning consent. Designed by Jestico + Whiles, the new school will rework the existing 19th century French Hospital building in Victoria Park Village and add a new four storey block to create a secondary school for 800 students following the ethos and philosophy of its existing facility Mossbourne Community Academy. Squire and Partners has won a competition to design a new sixth form facility for St James Senior Girls’ School in West London, providing an exemplary learning environment which facilitates a transition between secondary school and life as a young adult. This is a new steel-framed single storey pavilion building with a cantilevered roof canopy. The main objective here was to add a completely new, modern and welcoming administration and reception area in front of the existing entrance to suit the size of the school today and better encourage parents to access the school and facilitate dealing with visitors. To help achieve this, we injected more feeling of light and colour in order to enhance natural lighting as well as designing a lighting scheme that enhances all features after dark. The science departments at St Paul’s School have just moved into their new building, which was handed over in January 2013. NHA were appointed in 2006 to develop the whole school masterplan proposed by Patel Taylor on its prominent riverside site in Barnes. 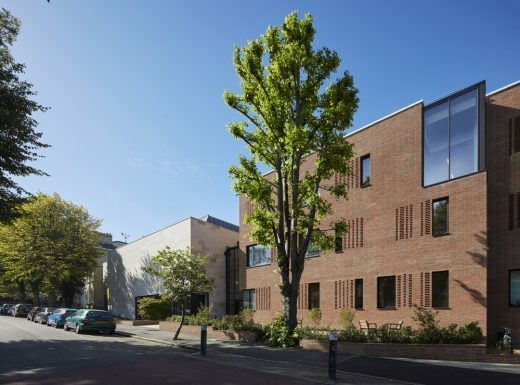 Special Educational Needs School in Southwark: Wright & Wright Architects has completed Newlands School, a 3175 sq m new-build Special Educational Needs (SEN) school that is specifically designed for children with Social, Emotional and Behavioural Difficulties (SEBD). Located in the London Borough of Southwark, Newlands School is one of the last projects to be built through the Building Schools for the Future (BSF) programme. The building was delivered by the Local Education Partnership ‘4 Futures’, a joint venture comprising Southwark Council, Balfour Beatty Education and Building Schools for the Future Investments (BSFi). This is a new community hub which includes a school building, a library, community learning facilities, council services, work studios and affordable housing, all in a single venue. The new school will provide the pupils of Tidemill Academy with first-class facilities to match the ‘outstanding’ education that Ofsted says they already receive. Classrooms wrap around a large courtyard garden, and school facilities shared with the community, including a rooftop sports pitch, are located within the adjacent Lounge building. The original school was designed Lutyens and is listed Grade II*. Any change of any kind was going to be controversial and 17 redevelopment schemes have previously been rejected. Following intensive consultation the practice drew up a masterplan for the whole campus stipulating much smaller buildings with external circulation along colonnades at two levels. BuckleyGrayYeoman Architects’ £6.5m plans for Channing School in Highgate have been granted planning permission by the London Borough of Haringey. The designs for the leading independent day school will add two buildings to the school’s estate, significantly improving Channing School’s facilities whilst remaining sensitive to, and building upon, its rich architectural and educational heritage. New London school building in the Borough of Lambeth – the first BSF school to receive a CABE ‘Excellent’ rating. Designed to accommodate up to 1,315 pupils, the 12,000m² school replaced existing 1950s buildings.